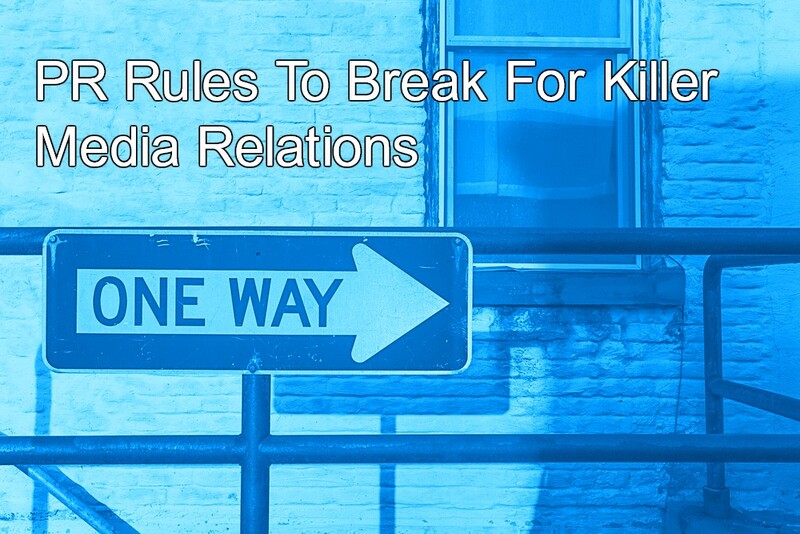 The best and brightest public relations teams have guidelines to achieve the best media relations results. However, when it comes to connecting with a producer or editor who is pitched hundreds of times in a single day, sometimes it pays to break the rules. While it’s true that for many journalists, the word “exclusive” is an immediate attention-grabber, it’s not always the best way to share a client’s news. If the product or service is new and unusual or the company’s research is groundbreaking, an exclusive (actually a “first-look”) should absolutely be considered, before going out to other media. However, if a brand is already well-known in the space and the product launch or other news has very broad appeal, going out broadly to press may be the best strategy. Decisions like this depend on brand goals and target audience and should be taken up together by both teams as part of overall media strategy. Never follow up by phone. Ah, the eternal quandary of PR people — the media follow-up. Our experience shows that it’s worth a try. Although many journalists say they hate receiving follow-up phone calls, some of our most memorable placements have resulted from simply calling someone and having a conversation. We’ve found that one polite call that gets to the point quickly can sometimes do the trick. We also advise against lengthy voicemails – or any voicemails unless you already have a relationship with a reporter. Fearlessness is a coveted quality in PR, so never be intimidated by a little phone rejection. It’s all part of the process of getting to know contacts and their preferences. Keep all pitches under two paragraphs. Well, that depends! A recent survey of journalists by Cision counts brevity and economy as the most crucial aspects of any email pitch. The results went on to say that the best pitches get to the point immediately and demonstrate value to an audience. However, there is varying opinion about the ideal length for emails. Suggestions include 20 words, 100 words, two paragraphs, three paragraphs and everything in between. The fact is, some stories can only be explained by going into detail. For example, we set up deskside visits with editors on behalf of a new IoT home health device that offered fairly complicated messaging. Our email pitch letters were three paragraphs long, with an image inserted. Here, the real key to success wasn’t the length of the letter but the subject line. We went with “Sick home” facts you need to know, and the open rate for the emails sent was among the best we’ve ever achieved. The ultimate outcome was dozens of desksiders and an equal number of stories. Never re-pitch once you’ve been turned down. We say, always re-pitch – if you’ve tweaked the story angle enough to be fresh and newly relevant. We recommend getting as much feedback from a media contact as possible to see why a story pitch was rejected. This way the smart PR team can go back to the drawing board and come up with an angle that’s more workable. As long as the pitch feels new and incorporates more of what an outlet or journalist needs, there’s a good chance of developing interest. Managing client expectations at this point is important as well. Everyone involved needs to understand that certain media pitching is the “long game” and should be viewed as one part of an overall media strategy. Always start with just a simple email. For some pitches, a simple to-the-point email is probably enough to get a reporter’s interest. But for more complex, visual or experiential concepts, a physical mailing can best communicate the idea. For example, to sample a new IoT security device or other tech product, we often send the item directly to the media to test. We also like to arrange for individual meetings or select groups at a single media outlet to take part in a fun presentation. And, often the way to these journalists’ hearts begins with a cleverly packaged, attention-getting physical mailer. Never pitch more than one contact at an outlet. In today’s fractured media world, this is a fairly antiquated notion. We believe in pitching as many appropriate contacts as possible. These can include writers and editors for different sections of a magazine or newspaper, or more than one segment producer for a TV interview. It can also mean a vast array of print freelancers and contributors to broadcast outlets. Penetrating this vast media world means reaching out as broadly as possible as there is also likely to be overlap. For example, we began a relationship with tech writer/TV contributor Carley Knobloch by offering her a piece of wearable security tech to review for her column. This turned into a TODAY show appearance and mentions in subsequent women’s magazines in which Carley was interviewed. Never reach out to a journalist on Twitter. It’s considered smart strategy to follow journalists on Twitter to help PR teams get to know likes and dislikes and areas of interest. But it has been frowned upon to reach out to media with a Twitter DM. We say, break that rule as well – but with care. By politely reaching out with appropriate messaging, we have forged some strong relationships that way. The bottom line is, [some] media rules were made to be broken.